Last year I posted some ideas for the Come Follow Me lessons, here is the link: LDS Come Follow Me Lesson and Mutual Ideas August 2014: Marriage and Family. See more ideas below. Good luck with your lessons!! This is such an important and special topic!! Why is family important? Begin by giving each youth a piece of paper. Invite the youth to take a minute and right on the paper why their family is important. Draw a large circle on the board. In the middle of the circle write "Family". In the large circle invite some of the youth to share with you something they wrote on their paper, why their family is important. Write these things in the large circle. 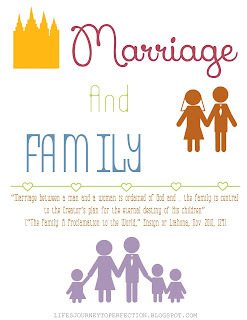 Invite a youth to read, “Marriage between a man and a woman is ordained of God and ... the family is central to the Creator’s plan for the eternal destiny of His children” (“The Family: A Proclamation to the World,” Ensign or Liahona, Nov. 2010, 129). 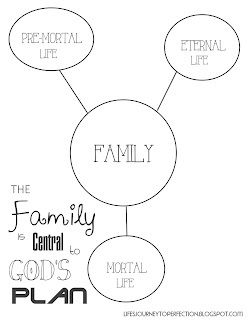 Invite the youth to share what "...the family is central to the Creator's plan..." means. Discussion might include that central means of the greatest importance or essential. 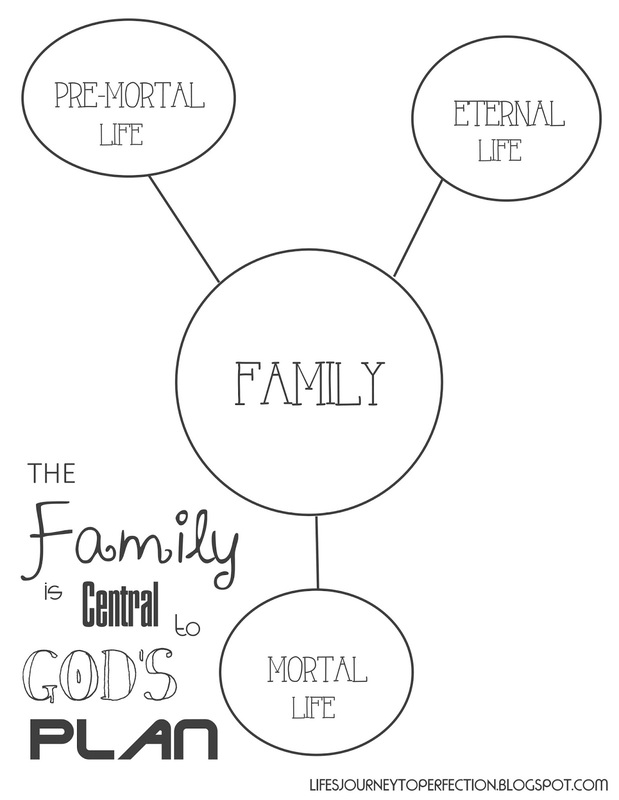 Why would families be essential to Heavenly Father's plan? Draw some lines extending out from the circle connecting to another circle at the end of each line. In these circles write, "Pre-mortal life", "Mortal Life", "Eternal Life". Before hand print out "The Family: A Proclamation to the world" Cut it up into paragraphs and number the paragraphs. Pass these paragraphs out to the youth. Invite them to read their paragraphs in order. Stopping after each paragraph to discus the paragraph, to find which circle the paragraph pertains to and writing some things that stand out in that paragraph next to the circles. Why is temple marriage important? Give each youth a small paper. 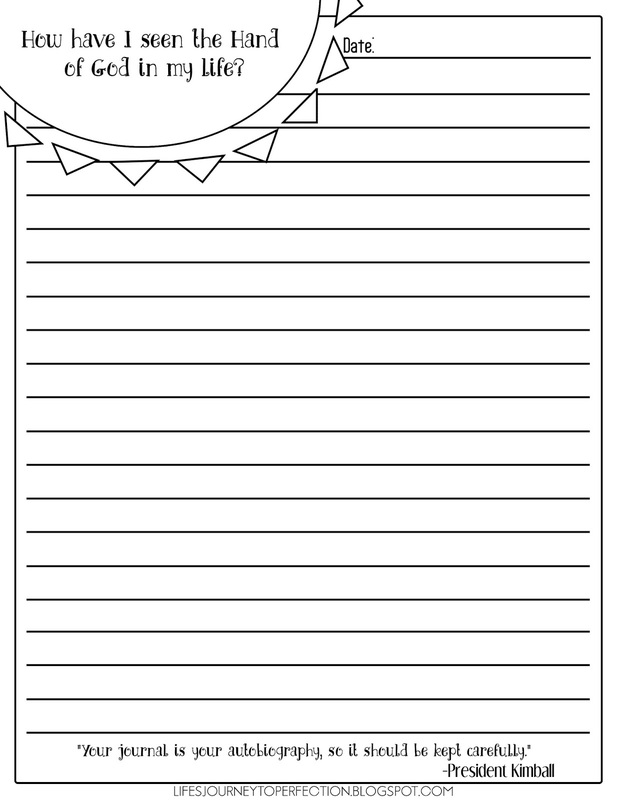 On the paper invite the youth to write one of their goals. Under the goal invite the youth to write some things that they will need to do to hel p the accomplish their goal. Invite some youth to share. Show the youth a picture of the temple. Explain that temple marriage is one of those essential saving ordinance that we need to obtain the Celestial Kingdom. 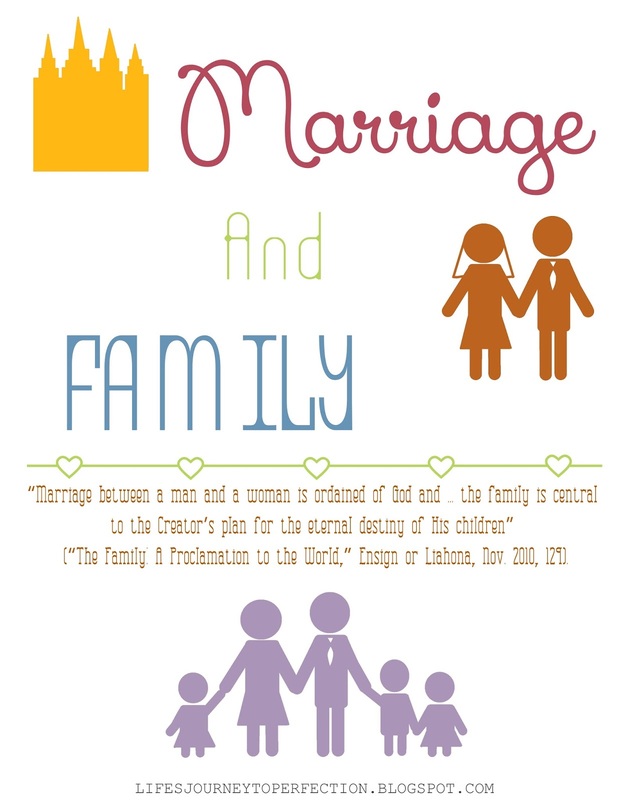 Invite a youth to read, "In our Heavenly Father’s plan of happiness, the only way to obtain exaltation is through the new and everlasting covenant of celestial marriage (see D&C 131:1–3). When a man and a woman are sealed to each other for time and all eternity in the temple, they have the assurance that their relationship will continue forever if they are true to their covenants. They know that nothing, not even death, can permanently separate them." Write the word Goal at the top of the page: Next to it write, "Exaltation". Under exaltation write the words, "Temple Marriage". Explain that our ultimate goal is exaltation or eternal life with our Father in Heaven. To get there we need Temple Marriage, which is also a very important goal. 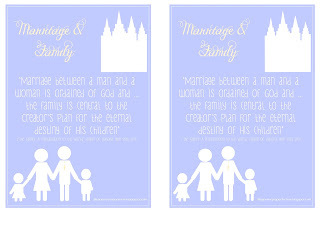 Invite the youth so share ways they can prepare for a Temple Marriage. Bring a paper chain (strips of paper linked together), also bring a metal chain. Explain that when someone is married civilly they are linked together like the paper chains, when someone dies the chain is broken, they are no longer bound together. Temple marriage is like the metal chain. When sealed together in one of our Heavenly Father's temples we have a strong bond that not even death can sever. We are sealed together as a family for all eternity. How will keeping a personal journal bless me and my family? Begin by showing the following pictures, Brass Plates and Gold Plates. Ask the youth what the picture is of? Ask the youth who wrote on the plates? Ask they youth if they have been blessed because of the writings on these plates? Now show the children your own personal journal if you have one, or you could share an ancestors. Share how you and your family have been blessed from your journal or an ancestors journal. Play the video, “O Remember, Remember” . Give each of the youth a piece of paper that says, "How have I seen the Hand of God in my life?" Invite the youth to take some time to write there thoughts and feelings to that question down. Before writing invite them to really ponder about the day, or even the week and think about how they have seen God in their life. Why is it important to learn about my family history? 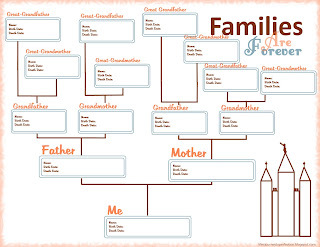 Give each youth a pedigree chart, see printables below. Invite the youth to write their name in to spot that is for them, write there birth date. 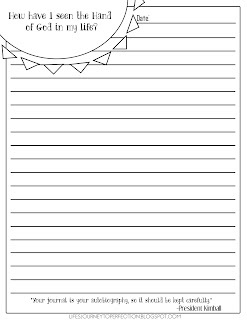 Explain that all of the other spots on the page are their family and as they begin to fill it out they will be learning more and sharing more of their family history. Have them next write their parents names on the paper in the appropriate spots. Invite them to think about something interesting or memorable about their parents. Invite them to write that next to their names. Next invite them to write their grandparents names on each side if they know them. Invite them to think about something they remember about each of their grandparents or something they have heard about each of the grandparents and have them write that on the paper. 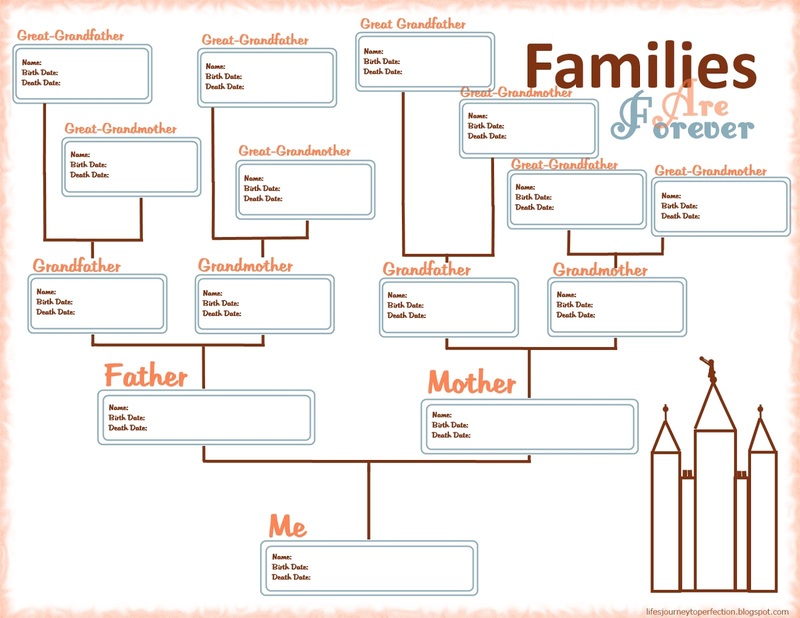 Point out the lines on the pedigree chart. Explain that we are linked to our family members. Invite a class member to read the following quote, "Heavenly Father’s plan of happiness enables family relationships to continue throughout eternity. " (Come Follow Me: Sunday School: August) Play the video, "Elder Bednar addresses Youth" Invite a youth to read, "Do you young people want a sure way to eliminate the influence of the adversary in your life? Immerse yourself in searching for your ancestors, prepare their names for the sacred vicarious ordinances available in the temple, and then go to the temple to stand as proxy for them to receive the ordinances of baptism and the gift of the Holy Ghost. As you grow older, you will be able to participate in receiving the other ordinances as well. I can think of no greater protection from the influence of the adversary in your life." (The Joy of Redeeming the Dead, Elder Richard G. Scott, October 2012 General Conference) Remind the youth that we have been promised Divine Protection as we participate in Family History work. How can I teach others how to do family history work? Draw a sketch of a small cliff on the board with a pathway leading to the base of it. Ask the youth if they could lift someone up to the top of the cliff if they were standing down the trail behind the person? No they would not be able to easily do so. Ask the youth if they could lift the person up if they were standing on the cliff higher than that person. Yes. Explain that the same could be said of teaching someone to do something. We first need to learn how to do it ourselves before we can teach someone else. Write the phrase, "How can I teach others how to do family history work?" on the board. Invite the youth to think for a moment how they would answer that question. Then invite the youth to come up and write an answer to that question onto the board. Explain that one of the reasons they are on the earth today, is that their talents and abilities are needed at this time to build the kingdom of God. Ask the youth if they know how to use the computer? Ask them if they know how to take and upload pictures? These are talents and abilities that they can share with others. Share some of the videos found on the youth page "Serve". Here are their links: "Help Others Find Records by Indexing"; "Help the Families You Home Teach"; "Help Others Come Back to Church"; "Help New Members Take a Name to the Temple"; "Help Others Add Photos and Documents to Their Family Tree"
Thanks for gathering all these extra teaching ideas!